The score board for Isle of Skye. Four random scoring conditions are chosen for each game and placed in each of the windows A-D. Being a chief wasn’t so bad. Until you heard about this king gig. Now you will do whatever it takes to become the new king, including buying up your opposing chiefs’ lands from under them–at least the valuable ones. And if the price is right. But you have to stay on your toes. There are lots of ways your clan’s territory can be evaluated, and your tactics one day won’t necessarily win you the next. Can you unite the clans and become the next king? Find out in Isle of Skye! 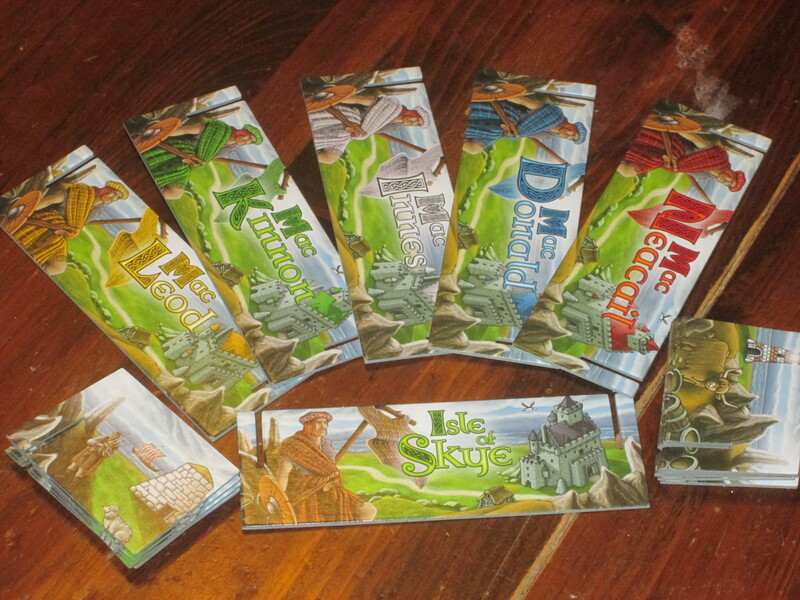 Isle of Skye: From Chieftain to King is a tile-laying/price-setting game with variable scoring for two to five players. Players set prices, purchase tiles, and place those tiles in their own territories to score points. The player with the most points at the end of the game is the winner. 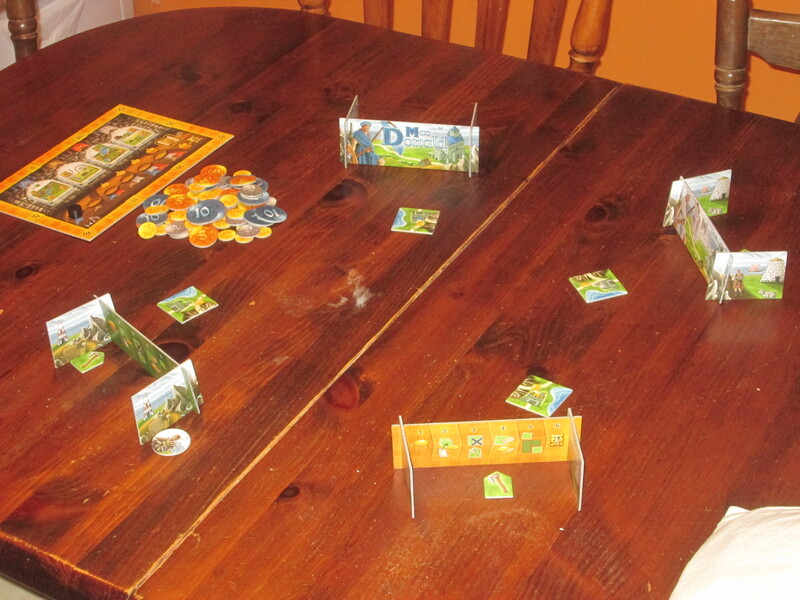 Isle of Skye set up for four players. To begin, place one scoring tile on each of the windows on the game board, and place the round marker on the board. 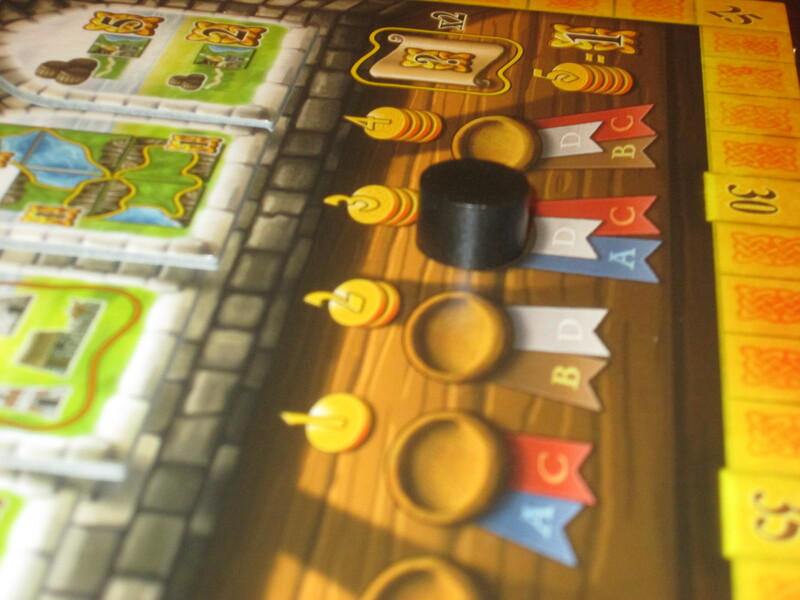 Each player takes an ax token and a castle tile, screen, and scoring marker of their color and places their scoring token on the score track. One player is assigned the chieftain token, and the game begins. A round is played in several short phases. 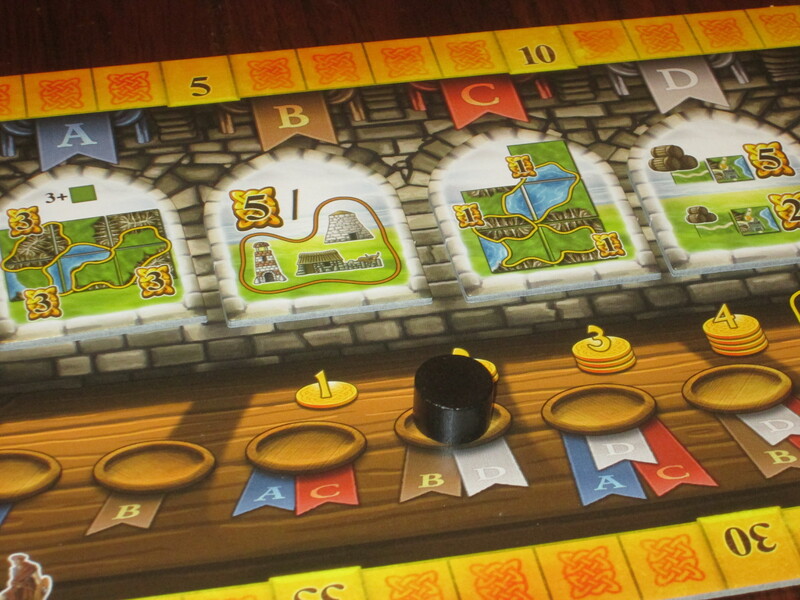 First, players collect money for their castle tile and any whiskey barrels connected to the castle by roads. Then they draw three tiles from the bag, placing them before their screens. Secretly and simultaneously, behind their screens, players assign their ax token to one tile (which will be discarded) and assign a value of at least 1 coin to the other two tiles. Once all players have assigned values, they lift their screens. 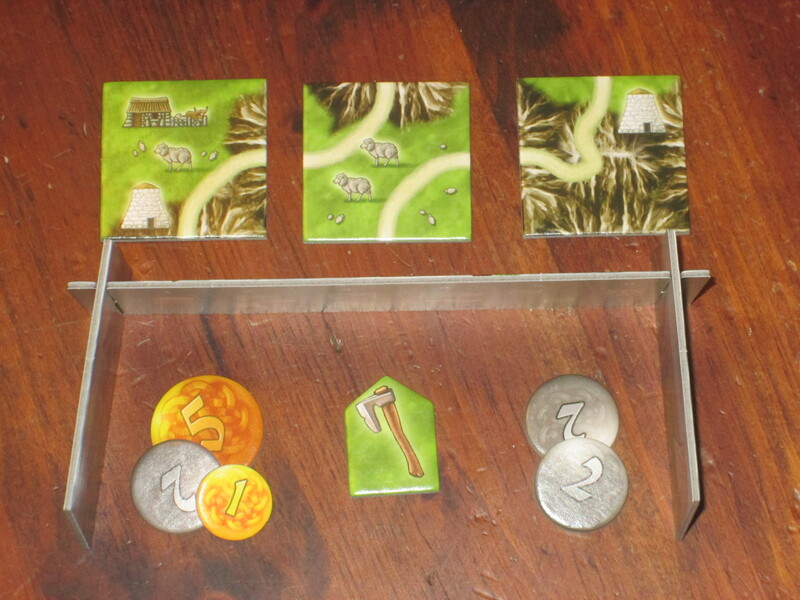 Axed tiles are returned to the bag, and beginning with the chieftain, each player may purchase one tile from another player, paying that player the value in coins assigned to the tile. Once each player has had the opportunity to purchase one tile, players return any money assigned to tiles still in front of them to the bank. They take those tiles and the one they purchased and place them in their clan territory however they choose. Tiles must match orthogonally edge to edge with landscape (meadow to meadow, mountain to mountain, water to water), although roads need not connect. Once all players have placed their tiles, players score points based on the scoring conditions for the round, some combination of the four windows placed at the start of the game. The chieftain marker passes clockwise and another round begins. After six rounds, players score endgame points for any special scoring opportunities in their territories (noted by scrolls) and score points for money they have leftover. The player with the most points wins. The Skye’s the Limit, or the Skye is Falling? I originally bought Isle of Skye because it looked similar to Castles of Mad King Ludwig, a game I enjoyed a lot but had trouble getting to the table because of its over-an-hour playtime. Both games involve price setting and tile laying, and I expected that Isle of Skye would scratch the itch while being a lesser version of it. But as it turns out, I actually prefer Isle of Skye and consider it one of the best games of 2015. 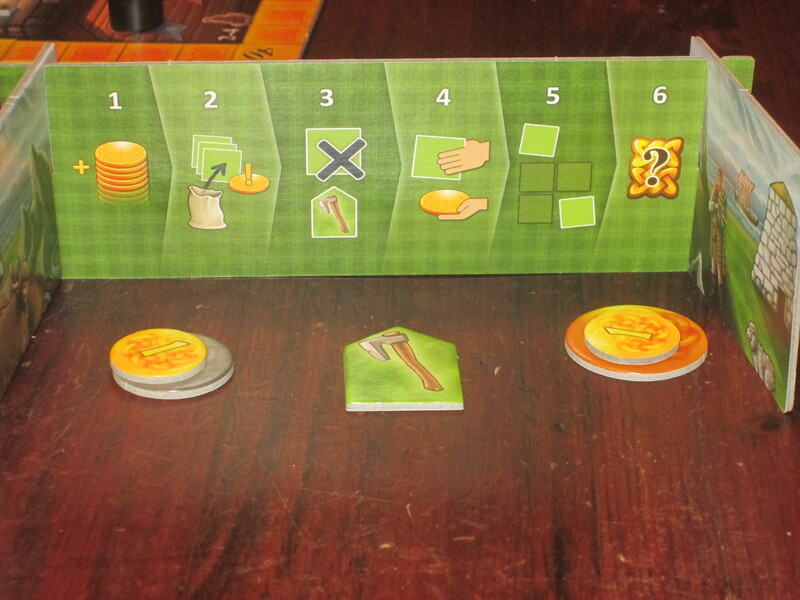 Each player receives a player screen to hide their money behind, especially when pricing tiles. These screens have to be assembled each game, but they have nice, flavorful artwork on them. Isle of Skye isn’t likely to win many awards for innovation. Price setting, tile laying, variable scoring–we’ve seen all these things before. Where Isle of Skye shines, though, is in the way it combines these familiar elements into a compelling yet accessible package that appeals to novice and experienced players alike. The rules are simple and can be explained in three minutes or less, yet there is lots of room for tense decisions and clever play. And while it looks like a lot that each round goes through six phases (! ), the game flows smoothly, and players forget what initially looked daunting. Unlike in Carcassonne, roads don’t have to connect in Isle of Skye…but it’s often beneficial (and more aesthetically pleasing) if they do. In addition to Castles of Mad King Ludwig, Isle of Skye is likely to be compared to Carcassonne, and while the two share tile laying/landscape making in common, I wouldn’t say they are all that similar. In Carcassonne, the tile-laying is the game–it’s what drives the action, it’s what allows players to horn in on their opponents’ gains, and each turn is marked by placing a tile, always. 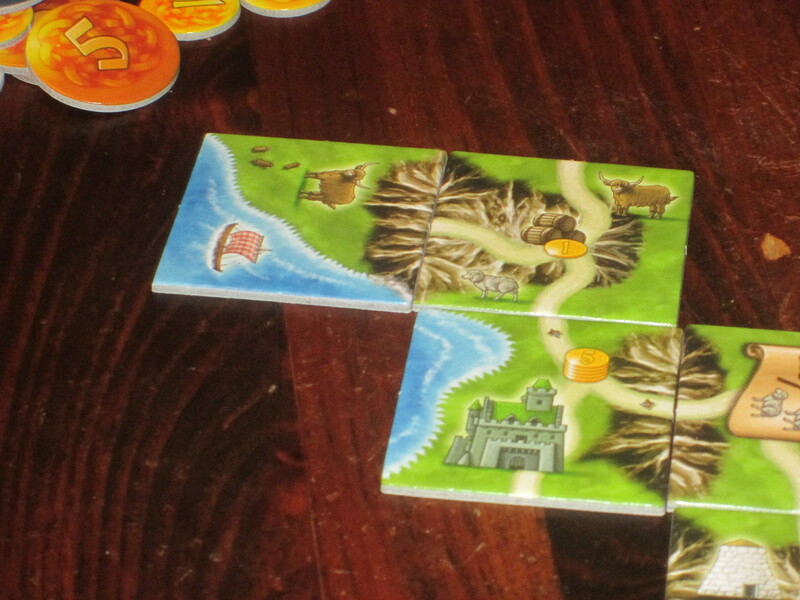 There are also more tile placement rules in Carcassonne, and clever plays come in the placement of tiles. There are several different features, all of which score points differently, but the different features always score in the same way. In Isle of Skye, there is tile laying, to be sure, and it is important, but it’s not necessarily the most important. There are fewer placement rules (roads don’t have to connect, although it’s sometimes beneficial if they do), and while there are some opportunities for clever play in placing tiles, players are most often given smart decisions in pricing and buying tiles. There are several scoring opportunities, but these opportunities change from game to game. What makes Carcassonne special is its common landscape; what makes Isle of Skye special is each player’s private territory. It is pleasant to build in relative peace (and to ignore connecting roads), arranging tiles just so and trying to find the best ways to score points. In each round, the other players can see which tiles you’ve drawn, but you set the prices secretly behind your screen. But just because each player has their own territory doesn’t mean the game is a solitary affair. The price-setting mechanism in Isle of Skye is ingenious. 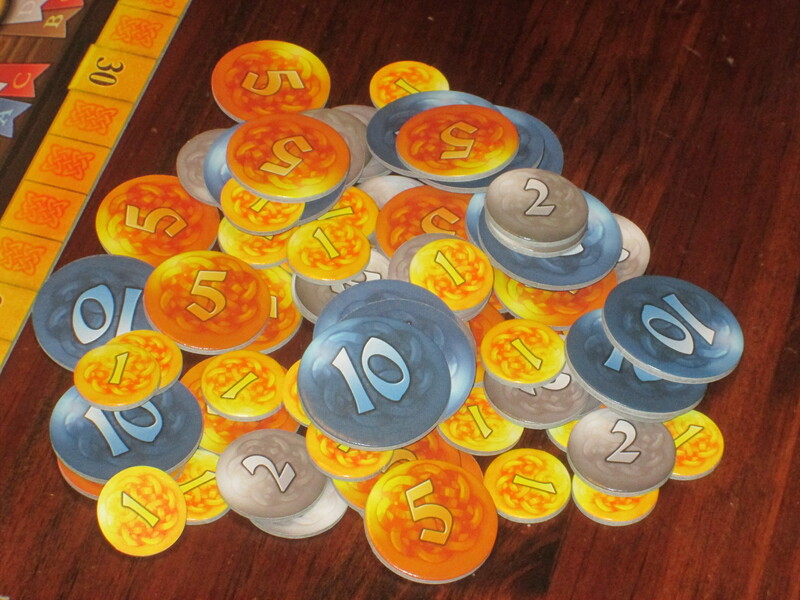 Players have to consider how much they want the tiles they’ve drawn from the bag. If they set their prices too low, the other players at the table will certainly buy them. If they price them too high, the other players might buy them (resulting in a huge windfall), or they might not, leaving a player cash strapped in future rounds. Further, players (especially early in turn order) have to consider how much money they want to save for purchasing other players’ tiles. This is always an interesting and tense decision, and players’ eyes will often rove around the table, seeing what tiles other players have in relation to their own tiles to determine how to set their prices. Each screen also includes a player aid, making the phases of each round clear. There is a further ingenious concept in the price setting: the ax token. One tile from each player is thrown back into the bag without having a price assigned. This is clever and adds yet another grueling decision. No matter how much money a player has, he or she can never acquire more than three tiles in a turn. And no matter how little money a player has, he or she is never without recourse for keeping a tile from another player’s grasp. There is tension as each player reveals the prices they’ve set, as you may have had your eyes set on the very tile an opponent chose to discard. There are moments in each game when the ax is a boon and a bane, and this helps to keep the game energized. The sixteen (!) scoring conditions that come with Isle of Skye. Each provides a different way to score points, and which window they appear in can make a huge difference. Also energizing the game is the four changing scoring conditions. Sixteen different scoring conditions are included in the box, and only four are used each game. This certainly sounds like a recipe for replayability, and in my experience, it provides it. Which scoring conditions are in the game has a huge impact on which tiles are valuable each game. For example, players may not in normal circumstances save much money for the end of the game: it’s better used to buy tiles and set prices in the game. But if the money scoring condition is on the table, players might be more frugal, trying to earn the points it provides. More than whether a scoring condition is in the game, when a scoring condition triggers also has a huge impact on the game. In one game, sets of lighthouses, brochs, and farms were worth 5 points each, and this scoring condition was in window D. This gave everyone at the table time to get their sets together before the first scoring, so each member of the sets was fought over for several rounds in advance. In another game, the same tile occurred in window A, making the competition much stiffer–in order to score sets three times, you had to assemble them early. This was difficult to do, but it gave this goal a new sense of immediacy, and some players decided to focus on other goals instead. The timing of the scoring conditions further casts light on tile valuation. A tile with three sheep on it is worth considerably more if you’re about to score the 1 point per sheep condition for the first time than if you’re about to score it for the third time. Yet these decisions aren’t always clear. Because the timing and scoring conditions change with each game, even though the kind of decisions players make is similar from game to game, each game still feels distinct. That is to say, the game is quite replayable. Scrolls provide end-game points, and if you can completely enclose an area (as the meadow here), the scrolls score double. The scoring windows aren’t the only way to score points. 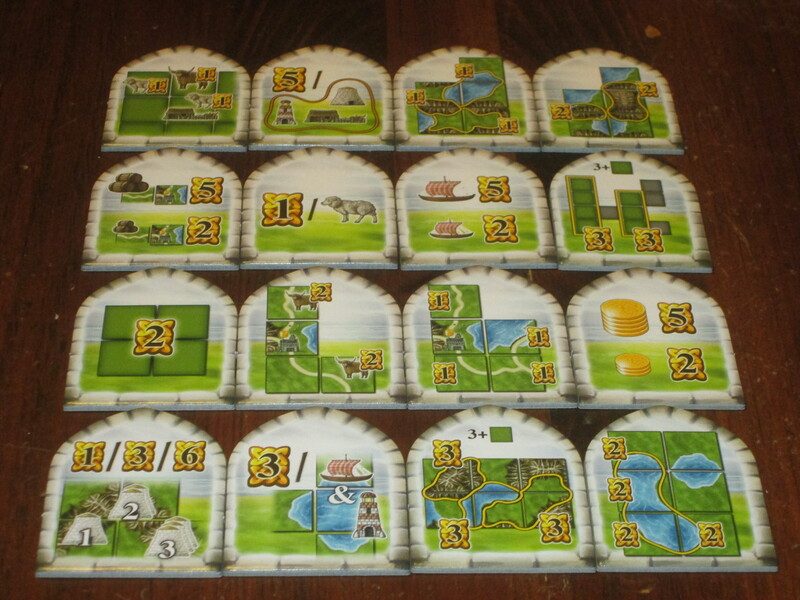 In addition to these, each symbol on the tiles has two corresponding scroll tiles in the bag, which score an individual player points based on how many of each symbol are in his or her territory at the end of the game. So even if ships aren’t worth anything in the main scoring conditions, if a player has a ship scroll, tiles with ships will be worth more to that player. The scrolls also serve to make players care more about the shape of their clan territory. 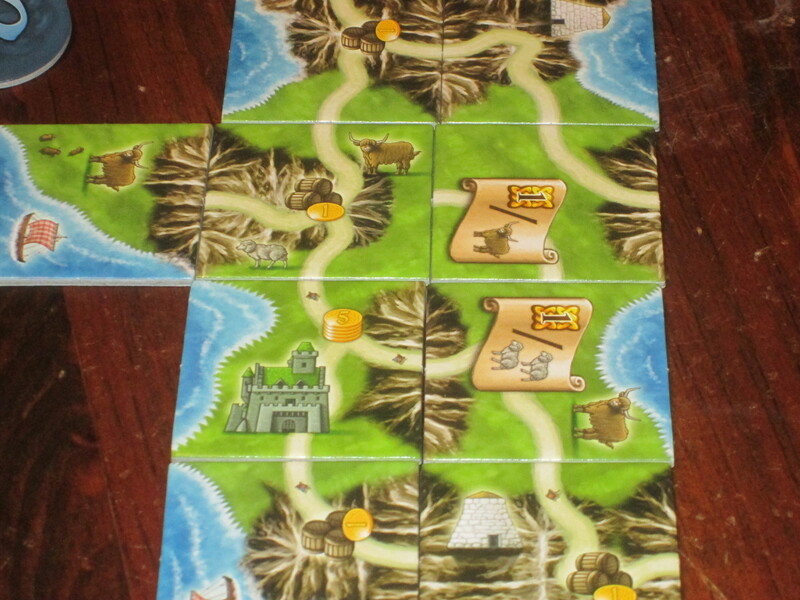 Scrolls always score their value; however, if a scroll is in a completely enclosed landscape area (think similar to Carcassonne), then the scroll scores double. This can be a huge boon, but for players to pull it off, they might have to forgo other gains in their territory. These scroll tiles make the game more interesting, especially because players have to price them appropriately if they want to hold on to them rather than seeing them in the hands of an opponent. When different windows score is important, and so is who is ahead at different points in the game. I’ve read forum posts questioning the “catch-up” mechanism in the game–starting with the third round, players get money for each person ahead of them on the score track. I put “catch-up” in quotation marks because I don’t think this is really a catch-up mechanism; rather, it is necessary to retain game balance. Most of the game is fairly controlled: players set prices, buy tiles, and place them wherever they want within their own territory. The part of the game that isn’t controlled is the initial tile draw at the start of the round. If a player draws tiles that everyone else wants (and can’t set prices high enough to deter them from buying them), they can get behind in scoring, and for no fault of their own. (The ax token also helps in this respect.) The compensation here is money, which, while worth some points at the end of the game, isn’t worth much. The monetary compensation rather ensures that the lagging players will be able to purchase a tile and possibly protect the ones they’ve drawn, making up for their stagnation in prior rounds. Of course, there’s also a fun puzzle for the more strategically inclined, similar to manipulating turn order in Power Grid: if you can stay competitive in the scoring and lag just a little, you can still get a decent payout to help you. If there’s a downside to Isle of Skye, it’s that it is best when played swiftly, and for whatever reason, the decisions in the game lock some players up. Setting prices for things is not everyone’s strong suit, and there’s something about doing it behind a screen that gives players permission to take their time. I’m usually pretty fast at doing this–I play a lot of games where the main mechanism is valuation–so my idea of slow might not be everyone’s. But I prefer this game when it moves at a brisk pace, and I don’t always get my way. That’s okay, but for some impatient players, this could be a deal breaker. Luckily, Isle of Skye does all it can to remain speedy: most of the difficult decisions (like pricing and placing tiles) are handled simultaneously. And even when the game moves slowly, it still usually lasts an hour or less, even with new players and a rules explanation. 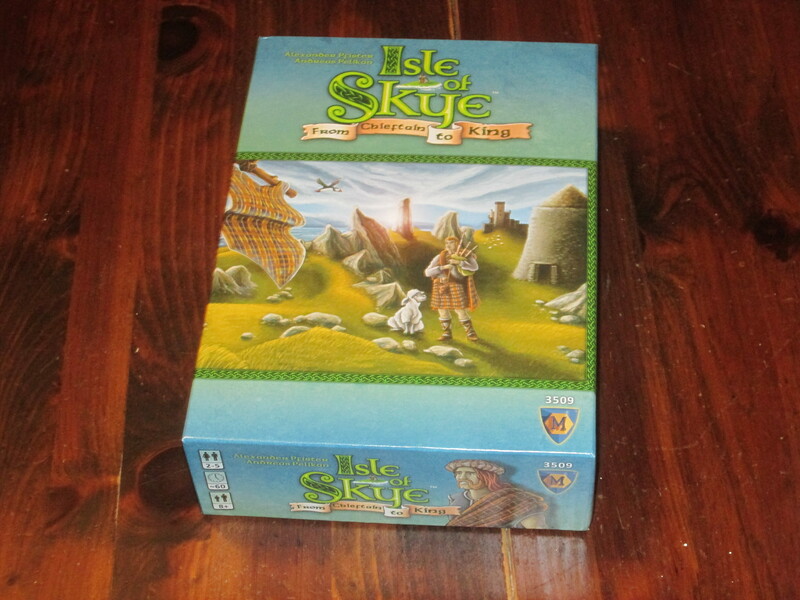 Isle of Skye is also a spatial game, which means that mental rotation is a necessary skill for playing. The mental rotation gap is mitigated in games like Carcassonne by playing on a central board, one tile at a time. It’s simply not a big deal in those games for a player to try the tile in several locations before choosing. But this is a little more difficult in Isle of Skye because each player has their own territory, so if players want to try tiles before buying them, it can slow the game down considerably. The coins in Isle of Skye are differentiated by color and size. It is easy to see prices across the table. The components in Isle of Skye are outstanding. The tiles, scoring windows, and money chits in the game are all on thick punchboard, and the frames yield the cardboard bits easily and without casualty. The money chits are different sizes and colors, dictated by denominations, and it’s easy to see prices across the table because of this. The tile art is simple but beautiful (it’s by Klemens Franz), and the tile symbols are clear, even across the table, making it easy (at least visually) to evaluate the tiles that others have. 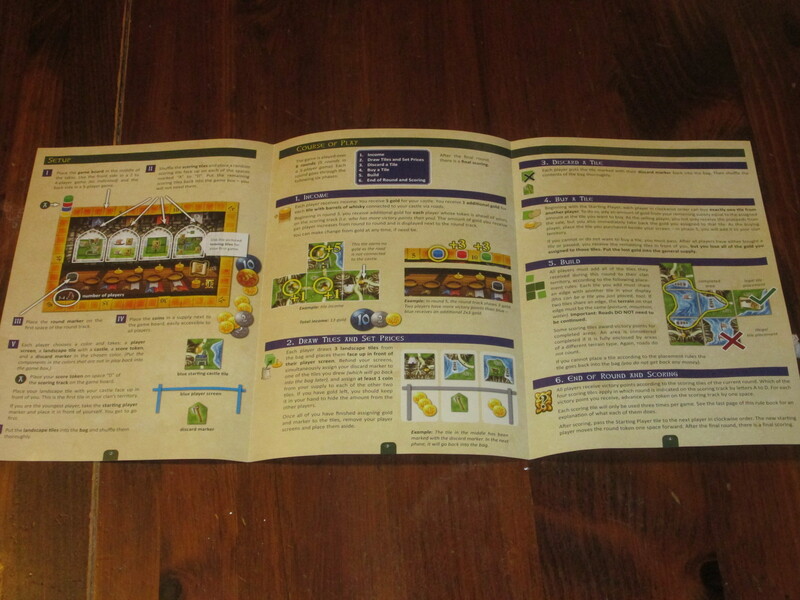 The rulebook is short and clear, making the simplicity of the game stand out. The screens have to be assembled each game, but this isn’t a big deal–they are sturdier for it–and they have a helpful player aid on the back of them. 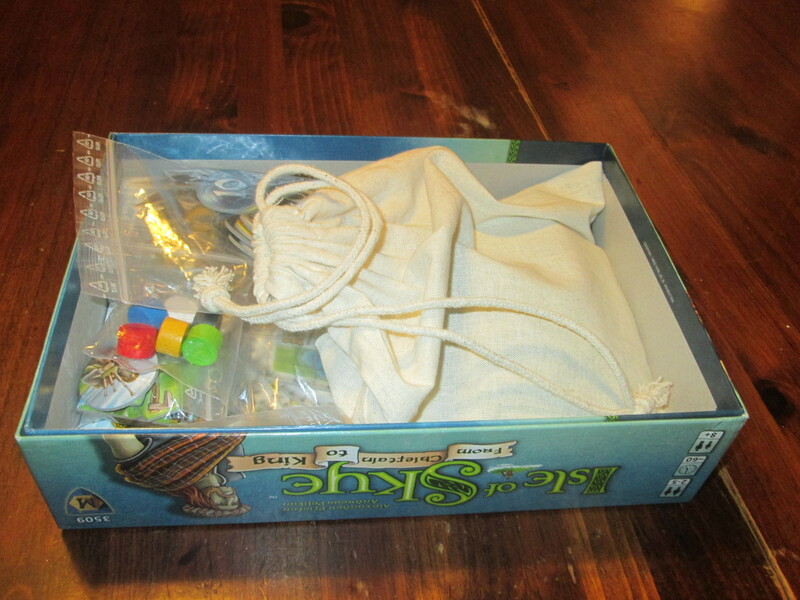 And I am so pleased that the game includes a bag to hold the tiles. Drawing tiles from a bag is much easier than arranging tiles in stacks and drawing them, yet many tile laying games these days don’t include tile bags. All told, I think the quality of the components matches the price of the game well. The game scales well from two to five players. With two, a player is always guaranteed at least one tile per round; with five, the “charity” before each round becomes more necessary (and more helpful). Isle of Skye, in its unassuming package, took me by surprise and is without question one of my favorite games from 2015. And I wouldn’t be surprised if, with continued plays, it becomes enthroned in my top ten games of all time. It is simple, elegant, and strategic. I can explain the rules to new players in minutes, but it is still satisfying (and exciting) to play. I’ve played most of my games over lunch breaks at work, and Isle of Skye is ideally suited for this. Isle of Skye doesn’t have much in it that would be considered innovative, but it combines familiar elements into an appealing package that still feels fresh with each play. I wouldn’t say Isle of Skye replaces games like Carcassonne or Castles of Mad King Ludwig–I still enjoy these other games–but it is my favorite of the three, and it is one destination I will keep taking friends and family to visit. If you have 2 light house scrolls on your map and you have a total of five light houses do you score five victory points or do you get ten because you have both light house scrolls? Each scroll scores independently, so you’d score 10. And if you enclose those scrolls, that’s a ton of points.